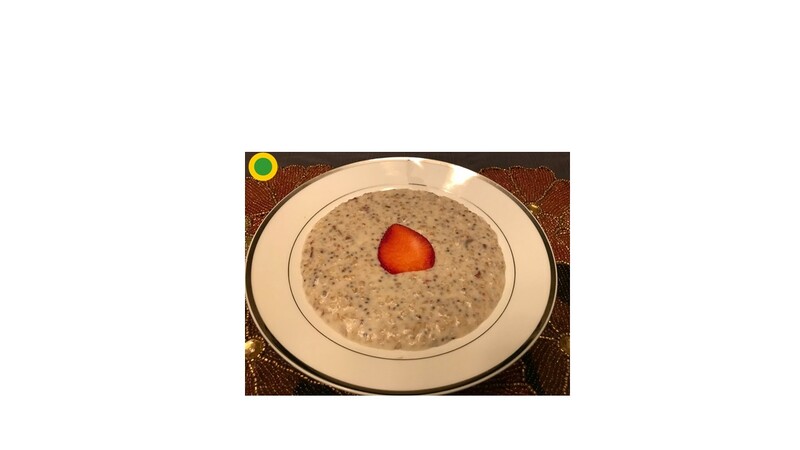 This great, simple, energy power and super heart healthy breakfast recipe is moderate in calories and a great balance of whole grain, protein, fat and dietary fiber. This recipe will keep you full and power you through your morning. It provides about 43% of the recommended daily value (DV) for dietary fiber. Dietary fibers is well known to lower cholesterol, blood pressure and improve cardiovascular health if consumed as a part of an overall healthy diet. Fiber also contributes to healthy blood sugar levels, digestive health and weight management. This recipe also provides about 30% of the recommended DV of calcium and iron. Calcium is essential for bone health and muscle function, and iron is essential for healthy blood cells and oxygen supply throughout the body. Chia seeds and fortified milk contributes to about 3.8 grams per serving of Omega-3 fatty acids that provide added cardiovascular advantages. Research suggests that omega-3s may decrease the risk of thrombosis and arrhythmias, and protect against heart attack, stroke and sudden cardiac death. In addition, this recipe provides B vitamins to help boost energy levels. Signup to view full recipe[/private]“>Please click here to print full recipe card and Pledge with us today for the meal plan that is right for you!